My blog is called “My Life as a Dancem0m”, and I’ve barely written a thing about dance! Now that the season is over, I thought I should write up what I thought about the three competitions our girls danced in. Eau Claire School of Dance competed in Hall of Fame, in downtown St. Paul; Midwest Starz, in Monticello, MN; and Masquerade, in Burnsville, MN. Rather than writing up one long post, I’m going to write about each of them separately. *I HATED the EARLY mornings (we’re talking hair and makeup done, and us there by 6:30 a.m.)!! When it took an hour to get hair and makeup ready – ugh! We did get it down to about 50 minutes by show time!! *My favorite competition overall was probably Masquerade, though each had great things about them. *Parents SHOULD NOT take pictures at competitions!! I didn’t realize that dancers can be docked for parents taking pictures while they were dancing until the last competition! A few classes risked elimination because of it. I took pics at the first competition, because I didn’t know… I hope I didn’t affect their scores!! *Though being a Dancem0m is a lot of work, and ended up costing me a lot of money, I wouldn’t have changed it! The friendships the girls and families made were so much closer than in years past. We are definitely going to miss everyone at Eau Claire School of Dance!!! 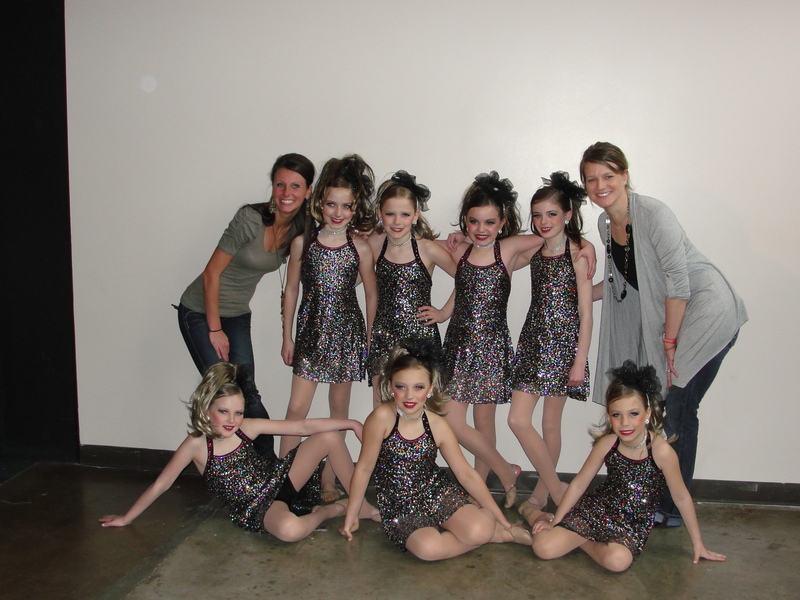 Grace's dance class, ready to go on stage for "Baby I'm a Star". Teachers, Miki and Stephanie by their side! We miss you guys, too, Sarah! !